No man stands alone. Our roots intertwine with others. Our basic needs for survival and belonging keep us together. We are social beings. Our sense of self first begins with family, then extends to friends and then further into community, religion and nationality. These are relationships that root us into the world. Through interaction and belonging we get to understand who we are and where we fit in. Disks speak of the earth, the realm of Mooladhara. In the five of disks the fears of this chakra are confronted. The structures that support the physical dimension are breaking. The body is frail and has many needs without which it would fold back into the elements. This is a moment of panic and desperation. 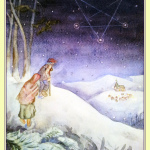 In this card an old couple makes their way out of a frozen forest, looking for refuge from the cold. They are weary and have no more resources to draw upon. In the deep of winter not all survive. There is scarcity and life is bleak. The colors of the year are gone and life’s energies want to turn inwards. Night descends to allow the inner dimensions to come out. In this darkness ghosts and demons take form and have a voice. They are the voice of fears and insecurities, our shadow side that waited quietly during the summer months. This is the dark night of the soul. It is an initiation through the first chakra. Death is knocking. What are you going to do? Five is a halfway point. You have started down a path where there is enough history and investment that you cannot go back. The question is how to go forward. 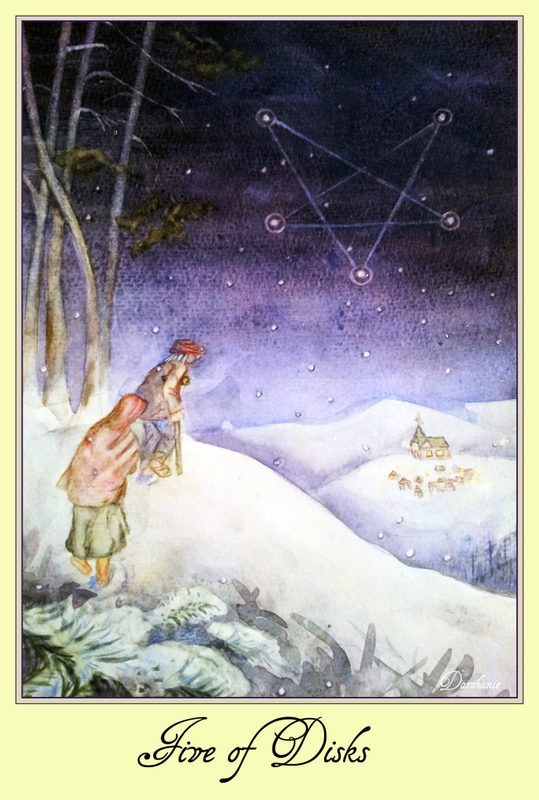 The stars in the heaven form a downward pointing pentagram which narrows the focus to physical needs. The couple is walking out of the dark forest which represents their personal landscape of fears. They look to the church and city for community and support. Five is a balance point between the inner and outer worlds. Here choices can be made with a window into both these dimensions of self. The two travelers, because of their weakened state are tempted to give up their freedom and personal power to the big institutions of society in exchange for safety and security. During times of loss you try to restructure, regroup and redefine your situation. What are you willing to trade for your survival? When a tree is young it needs support against the wind and protection from wild animals. But once it is established and strong it can rely on itself. Likewise, in the beginning you need the support from society and its institutions, but as you grow, you begin to understand your own personal strength. Winter is not a surprise as it happens every year. After living through a few, you learn how to prepare for it and enjoy its place within the year. The dark nights of the soul also come. It is part of life. You eventually learn that these dark winters are actually moments of opportunity to discover untapped strength. You learn to dig deep and a new wisdom emerges; the wisdom within darkness. The five of disks asks you to move smoothly into the darkness, to get to know it as your friend. The lotus originates in the darkness before it knows the light. Life starts deep in the earth, deep in the womb, and in darkness. Embrace the fears that Mooladhara brings up. Let the monsters out of the closet. They are your friends. In the closet they are your fears. Let them out so they can find their naturalness again. Make them part of you, part of your Being – this is the secret of wholeness. There is no split between light and dark. They are both within, both part of your being. Five is a pivotal number and determines the direction of the rest of the suit. When you get this card, there are issues that require inner and outer balance. Take time to reflect inside and embrace the darkness that is surfacing. Allow it a safe expression. Hear what it has to say. At the same time, find community in your outer world that supports the development of the person you want to become. Decisions at this point of your journey solidify your alliance with your world around you and your world within you.